We believe that Baptism is a beginning of faith and that it is clearly God’s work in our lives, rather than our work for God. In the Old Testament, Creation begins with the association of the Holy Spirit over the surface of the waters and Israel has baptismal-like water crossing events associated with the inheritance of the promises of God (the Exodus and Joshua 1). By reading Matthew 28:19-20 in the New Testament we understand that Jesus commands Baptism in His name, as He sends the disciples into the world. Shortly after this, in Acts 2:38-39, we read of repentance and Baptism ‘for the forgiveness of sins’ and that this ‘promise is for you and your children’. Later in Titus 3:5-7 we learn that we are saved by God through ‘the washing of rebirth and by the Holy Spirit’. We therefore share in this gift from God with all people of God, young and old. If you have questions about Baptism or wish to be baptized, please speak to the pastor. 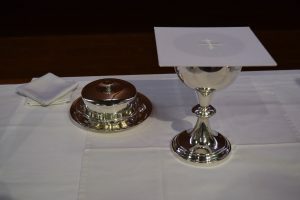 Also known as the Lord’s Supper, which was given by Jesus the night before His crucifixion, Communion follows Jesus’ commands to “do this in remembrance of me” (Luke 22:19) “for the forgiveness of sins” (Matthew 26:28. Communion also reminds us of the Passover meal, which was given by God the night before the exodus and included the whole family. Therefore, we have no set age limit for communion. However, children should be taught through communion instruction before partaking in the meal, as 1 Corinthians 10:15-17 and 11:17-32 include admonition to self examination. For visitors to this congregation, please speak to the Pastor before the service if you have any questions regarding communion. Those not communing may simply fold their hands or cross them over their chest to receive a blessing.